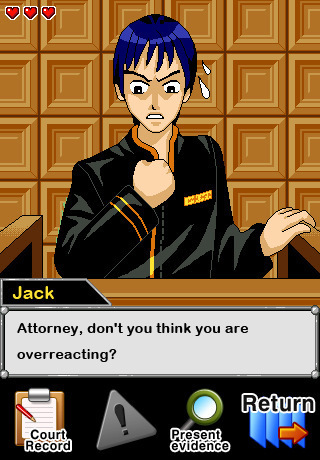 A cheap Phoenix Wright clone. 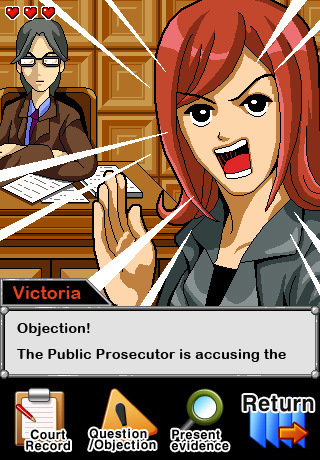 In ten words or less, Beauty Lawyer Victoria is a cheap Phoenix Wright clone. You star as Victoria, the Beauty Lawyer. Your client, Larry Butz Dennis, has been falsely accused of killing his girlfriend. Can you prove his innocence? I want to like this game. It has great potential to be a fun gameplay experience. But as things are, this game is merely passable. First off, the translation is extremely bland, with one or two grammatical errors. They need to spice up the dialogue. A perfect example of this is the prosecution’s opening statements. He says that the victim recently won the Miss USA Pageant. The prosecution argues that she instantly dumped her boyfriend, because he’s clearly not good enough to date Miss USA. Everyone instantly agrees that this is valid reasoning and a clear motive for murder. You see that? That’s comedy gold right there. “Come on, defendant, there’s no way she didn’t dump you! You’re clearly unattractive!” Alas, all potential humor is lost, due to the dull translation. The prosecution (and everyone else) are so boring that you’ll swear you’re actually seeing real lawyers at a trial. The game costs 99 cents, and it’s rather short. Then again, it is a bit longer than Phoenix Wright’s first case, in that Victoria has to go through more testimony than Phoenix does. Victoria also gets to go through an investigation section! Exciting, right? Well…not really. The investigation section is little more than “look at a picture of the hotel room and tap on the things you think count as evidence.” Here’s the kicker, though. The crime scene has eight pieces of evidence, but Victoria can only carry five at once. In other words, you’re forced to leave three pieces of evidence behind. I hope you’re good at guessing! If you miss out on one of the four necessary items, you get stuck in the trial and you have to restart the game. That’s right; you get a game over, unless you can randomly pick the four “right” items from a group of eight. That’s unnecessarily harsh. The game’s punishment system is also harsh; you get punished every time you re-listen to testimony. In other words, your cross-examination has to be perfect the first time around, or you’ll get dinged. This ignores the fact that it’s impossible to properly dissect a testimony without having heard it first. The worst offender is the second testimony, which mentions Room 803 three times. You somehow have to know ahead of time that only the third mention of this room is the one you can object to. People with psychic powers, who know what’s going to happen ahead of time, should have no problem with this game, though. The music and graphics are about 20 years behind the times, but they’re not bad. At least one of the 16-bit tunes was rather catchy, and some of the flashback pictures looked rather nice. The end of the game was not nice. In fact, it didn’t even make sense. Victoria manages to catch the real criminal, because he knows the difference between a rope and a belt. No, I’m not making that up. The culprit says that there was a belt in the victim’s room, and Victoria concludes he must be guilty, because she thought it was a rope. “You must be guilty!” Victoria says confidently. “How did you know this rope is really a belt?” Victoria, it looks just like a belt; that’s how he knew. It has a belt buckle on it, for crying out loud. Only an idiot would mistake the belt for a rope. There is nothing incriminating about saying that the belt found at the crime scene was, in fact, a belt. Anyway, that’s Beauty Lawyer Victoria. It’s a paid app, with unremovable ads playing during every second of the game. The translation is bare bones, and the game expects you to know what to do ahead of time. Kill the unnecessary difficulty, spice up the translation, and you’ll have a somewhat entertaining game. 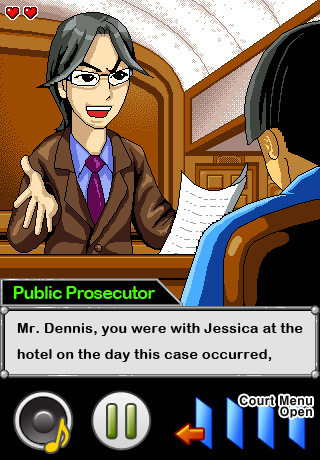 As it is, you just have a cheap, poorly-made game which tries to cash in on the success of Phoenix Wright by badly imitating his first adventure. Victoria game is really decent game. If we miss out on one of the four necessary items, we can get stuck in the trial and we have to restart the game. Indie developer Tony "hotshot 10101" Pitman and GC's Eric Regan discuss the Virtual Boy, EA's Online Pass, Marvel vs. Capcom 3 characters, and more.